The course participants will learn the processing from the first beginning of data collection, through pre-processing, automatic particle picking, alignments, 3D reconstruction, "4D" image analyis of data-sets with mixed populations, up to the interpretation of the data and fitting of known X-ray structures. The course participants must bring along their own notebook computers (MS Windows (8.1 or 10) / Linux (e.g. Ubuntu 14.04 or later) / Mac OS X vs 10.10 (Yosemite) or later) onto which all necessary software will be installed. Most data processing will take place in the context of the IMAGIC software package but other software will be available, including Frealign and Chimera. 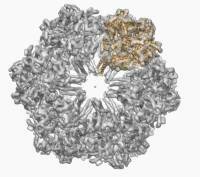 Sample cryo-EM data sets will be distributed for processing during the course. The course participants may bring along their own data sets for discussion. The lecture room with LCD projector will be available, as well as some smaller meeting rooms. Parallel processing using MPI will be available for participants with multi-core CPUs in their notebook computers. The school will be limited to 30 participants. Course participants are expected to give a presentation of their current project.